Alchemy's Silken Straw is pure elegance with a beautiful and sophisticated rusticity. It is delicately woven into a distinctive texture that looks like straw, but feels like heaven! Its equally unique hand-dyed palette comes from silk's wonderful ability to soak up deep, rich color. 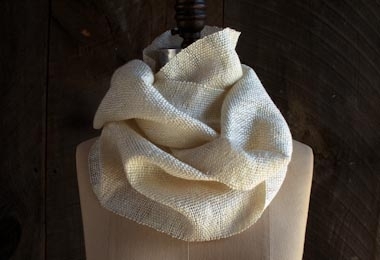 Use Silken Straw for incredible wraps and summer sweaters!